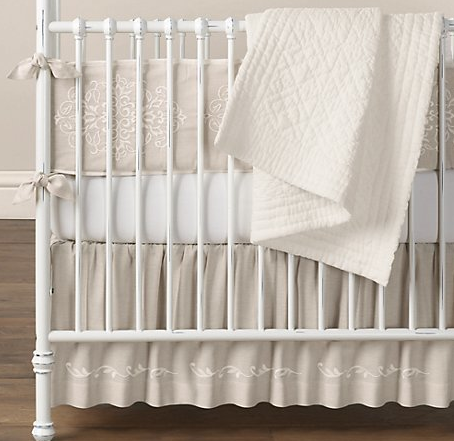 Our High vs Low this week is serene, neutral, natural linen crib bedding. If you read this blog regularly you might have noticed that there are two major trends going on for nurseries. Soft and barely there neutral or bold and bright. Obviously this bedding is classified under the soft and barely there neutral. This look can work in modern or traditional settings, the artwork and furniture will determine that. The Marlo crib set from Serena & Lily is one of my absolute favorites. Simple, sophisticated with a touch of ethnicity because of the mexican suzani inspired embroidery. Now the $995 price tag is quite a lot for crib bedding, especially if your child ends up being one who likes to spit up in the crib (thankfully mine was not one of these). To spice it up, add a blue, pink or lavender crib sheet. For a similar look at only a third of the price look into the Embroidered Trellis set by Restoration Hardware Baby & Child for $299. Yes the Marlo design came first so Restoration Hardware may have been playing a little copy cat, but still I really like this alternative. It has a less ethnic and simpler look with much less embroidery. The Etched Trellis rug they made to match really helps make the embroidered pattern pop too. 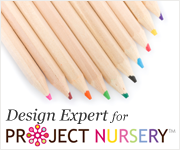 Its a great resource related to the nursery furniture.. I was looking for such crib ina limited budget.. After reading your post I gathered a huge knowledge related to crib.. Thanks for sharing..
Really the crib is very simple and beautiful. The design is pretty nice and seems to be very comfortable as well.